WASHINGTON (CNS) — Shootings in places of worship are fairly uncommon, but the public nature of churches, synagogues and temples sometimes makes them appealing targets for violent acts. The federal government June 18 released its first guidelines for houses of worship confronted with a homicidal gunman. 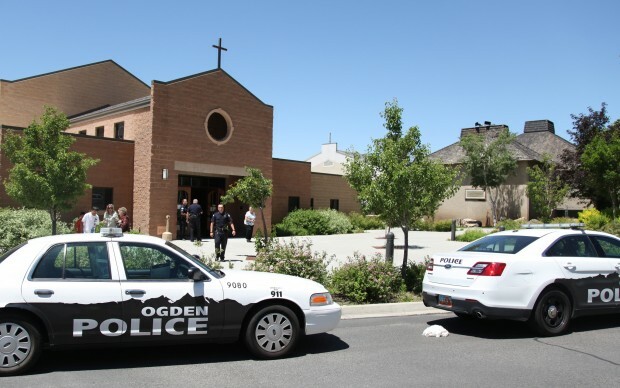 They were issued just two days after 66-year-old James Evans was shot by his 35-year-old son-in-law inside St. James the Just Catholic Church in Ogden, Utah. Police identified the shooter as Charles Richard Jennings Jr. of North Ogden. Jennings allegedly walked into the church and shot Evans just before Communion. In Utah, if an individual has a concealed firearm permit, he or she can bring a concealed weapon into a church unless the church itself prohibits firearms. The Utah Department of Public Safety’s website provides a list of those locations. Father Richtsteig said he has no problem with this law. He noted that gun-free zones don’t make anyone safe. “It’s not because of guns, it’s because of a man who made an evil decision,” Father Richtsteig said. Addressing today’s violence and anger, Father Richtsteig said he does not think people are any angrier now than they were in the past. Divorce or the breakdown of the family and bad child rearing can play a significant role. In Ogden, Jennings’ motive was not clear, but police had received domestic violence reports about him. “People aren’t teaching their children to accept hearing ‘no’ and to treat other people with grace and compassion,” Father Richtsteig told CNS. Consistent with the federal government’s guidelines, the priest said people must look less at how they can prevent inevitable violent incidents and more at how to prepare people to deal with them and respond in a safe manner. “Tell people not to be paranoid but to plan for emergencies,” he said. The release of the government guidelines came just after the six-month anniversary of the Dec. 14, 2012, mass shooting at Sandy Hook Elementary School in Newtown, Conn. Tragedies like Sandy Hook have triggered considerable public debate about gun laws and safety in the United States. Following that shooting massacre, President Barack Obama assigned a task force headed by Vice President Joe Biden to draft a proposal on reducing gun violence for lawmakers to consider. Nonetheless, Congress has done little to implement change in the form of new federal gun control legislation. In April, the U.S. Senate struck down a plan to strengthen background checks on firearm sales as well as a proposal to ban some semi-automatic weapons resembling military assault weapons. Biden has said the executive branch is working to make gun control a priority for lawmakers again. In a Dec. 21 statement about the Sandy Hook shooting, the chairmen of three U.S. bishops’ committees — domestic policy, communications, and marriage and family life — reiterated some of what the full body of bishops called for in a 2000 statement on crime and criminal justice. They called for measures that control the sale and use of firearms and make guns safer. The also urged sensible regulations of handguns and limited access to assault weapons. The suggested course of action is to “run, hide or fight.” This means leaving the building to seek shelter in a safe location or hiding and waiting for police to arrive. As a last resort, people should fight back in an attempt to stop the shooter. Dioceses across the nation have various precautions in place or are developing them to prepare for or respond to gun violence in churches. Dianne Dunagan with the Office of Media Relations for the Archdiocese of Chicago said that several organized groups in the community play a large role in dealing with violence and promoting nonviolence in homes, on the streets and in neighborhoods. “Their focus is directed at the root causes of violence and at the foundational blocks for building a nonviolent society,” Dunagan said. Father Theodore Parker, pastor of St. Charles Lwanga Parish in Detroit, does not feel allowing guns in any church is a good idea. His parish has worked to prevent criminal activity and raise awareness about violence. About three years ago, the parish council at his church was discussing problems in Detroit, focusing on violence. What resulted from the conversation was the parish deciding to have a gun buyback where people could exchange their guns for money, much of which was raised by parishioners. About 120 people sold their guns at the third and most recent buyback in August 2012. “When we did the gun buyback, we had opposition from outside people saying, ‘We’ll give you more money than they’re giving you for your guns,'” he told CNS. Father Parker said that while he feels guns are appropriate in rural settings for purposes such as hunting, urban settings are different. Father Parker believes that the issue of gun violence has less to do with anger and more to do with the attitudes of society. “I think our society has a lack of respect — for individuals and for institutions,” he said.